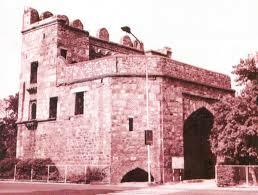 The Khooni Darwaza earned its name after the three princes of the Mughal dynasty - Bahadur Shah Zafar's sons Mirza Mughal and Mirza Khizr Sultan and grandson Mirza Abu Bakht, were shot by a British Soldier, Captain William Hodson on September 22, 1857 during the Indian Rebellion. 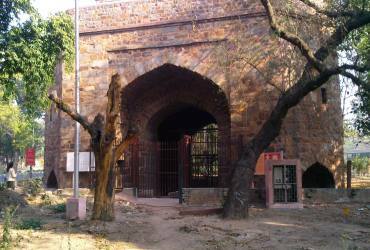 Hodson obtained the surrender of the Emperor, and the next day asked for an unconditional surrender from the three princes at Humayun's Tomb. Hudson arrested about 16 members of the Emperor's family and was transporting them from the fort in horse driven carriage accompanied by a platoon of 100 "Savars" or mounted soldiers. 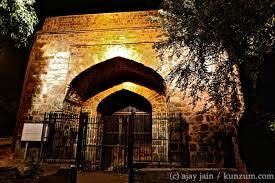 On reaching this gate, he was stopped and surrounded by thousands of Muslims, with white cloth tied on their foreheads (a symbol for the shroud) Jehais or Gazis. Hudson latter recalled, "I was surrounded on all side by Ghazis as far as my eyes could see. According to Archaeological Survey of India's, board on the site/gate, it says Hudson, made them remove their "upper" garments and using his service "sword" he "hacked"/cut the heads of all three sons, and entered the carriage and "slaughtered all men, women and children." Others assert that Hodson ordered the three to get down at the spot, stripped them naked and shot them dead at point blank range. 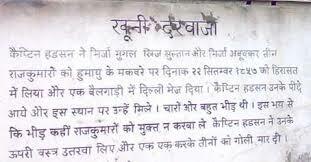 The bodies were then taken away and put up for public display in front of a Kotwali.